"A coach had even rammed the boundary wall of a college building near our house," said Manoj Baliyan, who runs a shop in the area. Manoj Baliyan was enjoying the cool evening breeze sitting on the porch of his house on Saturday when he heard a massive thud. The next thing he saw was a blue railway coach flying over another coach and hit his house. When he gathered his wits all he could see was scores of bodies in front of the house, along the railway track. The railway accident in Khatauli brought tragedy for not only the passengers of the Utkal Express, but also for locals whose houses lined the tracks. The accident occurred around 5.45 pm near Khatauli town and left 20 dead and over 90 injured, the Uttar Pradesh Police said. Khatauli is approximately 40 km from Muzaffarnagar. Manoj Baliyan, 42 and his family are still shaken as one end of the mangled sleeper coach (S2) of the train, which had rammed his house's porch, shattering its facade, is leaning precariously on the house. "There was a massive thud and one of the coaches flew over the pantry car and rammed our house's porch," he told PTI. The other end of the S2 coach is resting over the pantry coach with its doors shattered. NDRF personnel, pressed into service for search and rescue operations, were seen pulling out bodies from the mangled coach that had rammed the boundary wall of Choudhary Tilak Ram Inter College. "We pulled out the body of a woman from underneath the coach. We have noticed a limb in the debris and efforts are on to pull out the body," an NDRF personnel said. Uttar Pradesh ministers Suresh Rana and Satish Mahana visited the accident site and took stock of the situation. "The Uttar Pradesh Chief Minister is continuously tracking the update on the accident," Mr Rana said. A sense of fear pervaded the site's atmosphere, while for the passengers of the train and the locals the night has turned into a nightmare. 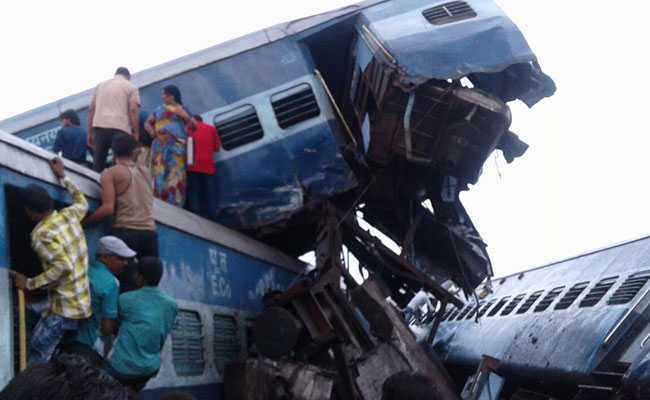 Thirteen coaches of the Utkal Express jumped the rails, with one of them crashing into a house adjacent to the track.